Capital One VentureOne Card Worth It? 3% Cash Advance and Balance Transfer fee is good. 10x miles on purchases on hotels.com is awesome opportunity. Consumers can gain much with this rate if their purchase is too much on hotels. Minimum APR is 13.24%. If you have very good credit score, this APR can be very good for you. 20000 bonus for $1000 purchase is a good promotion of the card. 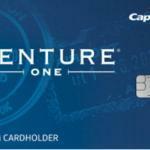 No annual fee for Capital One VentureOne Card. There are many benefits of Capital One VentureOne Card. Especially focused on Travel. 1.25 regular miles per $1 is below average. Maximum APR is too much. 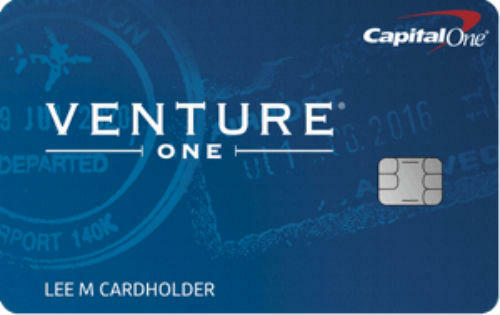 As same as many other one cards of Capital One, VentureOne is a credit card with less rewards and also less interest rate. We are going to review Capital One VentureOne Card on this page for you. You can find detailed information below. Introductory APR: 12 Months 0% for Purchase and Balance Transfer. We believe that current interest rates of the card is not that bad. Especially we like the minimum APR rate. However 25.24% maximum interest rate is too high for someone with excellent credit score. 1.25x miles for purchase is also below average. If you have too much hotel purchases, this card will worth it. You will need to book from hotels.com though. Otherwise it is not going to be beneficial much for you. We recommend you to try Capital One Venture Card which we have reviewed on Credit Card Center recently. You are going to get 1.25x miles per $1 with this card and actually we didn’t like it much. It is below the average. However 10x miles from hotels.com purchases is awesome opportunity. Additionally you can also get 20000 bonus points with only spending $1000 in first three months. Except regular miles rate, we liked all other rewards and bonuses of the card. Fees are quite good in Capital One VentureOne Card. No foreign transaction fee, no annual fee are very good. 3% balance transfer fee and cash advance is very good for cards at this level. You can see all rates and fees of Capital One VentureOne Card below. There is also editor scores of the card. 13.24%, 21.24% or 25.24% 10x miles on hotels.com purchases. 1.25x miles on purchases for all categories. You like/dislike Capital One VentureOne Card. Our visitors can determine rank of cards on Credit Card Center with review them. You can leave a review below and let other consumers to know about the card.